Mexico produces 50-100 films per year with a very active movie industry. Numerous American celebrities have crossed the border to make Mexican movies between American film projects. Unlike the US, where there was a wide variety of sizes issued on a particular film, Mexico utilized 4 primary sizes. Older Mexican one sheets were produced on extremely thin newspaper grade paper which makes them very delicate and difficult to handle. It also makes the older ones harder to find in good condition. They utilized a lot of brown tones and contain some beautiful artwork. Pre-70's Mexican posters were normally 26x39 but in the mid to late 70's, when clay-coating became popular, they took on more of an American look, measuring 27x41 with a glossy coating. Recent Mexican posters have conformed to the worldwide standard of 27x40. The Mexican half sheet was not widely used except on major releases. It is on card stock like the US version but measures 20x28 which is a little smaller than the US half sheet. Also smaller than its US counterpart, the Mexican window card measures 12 1/2 x 19 1/2. These are also printed on card stock with an open space on the top of the card for theater infomation to be written. Mexican lobby cards, which normally measure 14x17 are larger and sometimes more colorful than the American version. 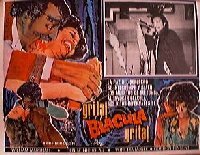 Unlike US lobby cards that have a small border and a wide variety of images, Mexican lobby cards normally consist of a black and white still with a large border that is artwork from the movie. So each lobby card has a lot of artwork from the film. The sets are normally issued in a set of 8 like in the US, but for major early releases, it is not unusual for an 'A' set and a 'B' set to be issued. 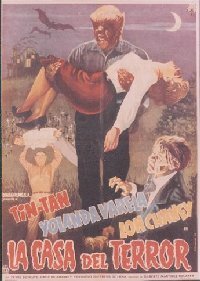 These are different from the Spanish lobby cards that are issued in the US for Spanish speaking theaters. These are 11x14 (the standard US lobby card size) on card stock. They are done in very small quantity and usually an actual still from the film is glued to the card. We have these listed as Spanish International lobby cards. Almost all Mexican posters contain the tag 'Printed in Mexico' on the bottom. Notice: the Mexican poster on the right is from our collection and one of my favorites. It's for the film House of Terror with Lon Chaney playing both the Werewolf and Frankenstein without speaking one word in the film. Usually the best way to tell a reissue is by the studio logo. For Mexican posters of US releases.. if the poster has the original studio release logo on it, such as MGM or Columbia, - it's normally an original. If it carries a Mexican distributing company - usually it's a reissue. This is only for major studio productions from the US though. Reproductions are becoming more common. To see what Mexican posters that we have in our database, click here. The green dollar mark means that one of our dealers have that poster for sale.